Claude Arpi: More Chinese Tourists in India? Before his first meeting with Dr. Manmohan Singh in Durban, South Africa, President Xi Jinping declared that he and his team would continue with the previous administration’s friendly approach to India. He mentioned boosting economic ties and cooperation on multilateral issues. He seemed keen to keep on the back-burner issues such as the border dispute, transboundary rivers and China's ongoing projects in Pakistan-occupied Kashmir. First, to maintain strategic communication and keep bilateral relations on the right track. Second, we [China] should harness each other’s comparative strength and expand win-win cooperation in infrastructure, mutual investment and other areas. Third, we should strengthen cultural ties and constantly increase mutual understanding and friendship between our peoples. Fourth, we should expand coordination and collaboration in multilateral affairs to jointly safeguard the legitimate rights and interests of developing countries and tackle global challenges. Fifth, we should accommodate each other’s core concerns and properly handle problems and differences existing between our two countries. At that time, it was thought that the 'mutual understanding and friendship between our peoples' would be synonymous of more Chinese tourists visiting India and vice-versa. Nothing on these lines was mentioned in the Joint Statement signed during Premier Li's visit in Delhi. A couple of years back, Xinhua reported that while 550,000 Indian tourists visited China in 2010 (a 22 % growth from the previous year), only 100,000 Chinese tourists came to India. These figures were given by China National Tourist Office in New Delhi. According to Chinese tour operators, high hotel price and lack of hygiene were among the factors that hinder more tourists. Xinhua quoted Catherine Ho, deputy manager of GZL International Travel Service which had participated in 'India Outbound Travel Mart' for the past 10 years. She explained that high price, language, food and hygiene were the hindering factors. Ho particularly mentioned hygiene: "more than 60 percent of our Chinese guests who came to India experience diarrhea due to unhygienic food, therefore they had to be more carefully about what they eat and drink while more Chinese residences in Australia and South East make these destinations language and food problem free." Then it is difficult to get tourist visa from China: "Recently it took more time to get visa, and sometimes applications was refused by Indian embassy in China saying that the applicant looked like business traveler rather than tourists," she told Xinhua. The issue seemed to have been skipped during the recent visit of Premier Li Keqiang in India. When one reads the article of The South China Morning Post posted below, it is perhaps better to go slow on the development of the tourist industry between India and China, in view of each side's serious recriminations against the other. There is another angle to it, the security issue. The 'spy' hailing from Nagchu prefecture in central Tibet would have confessed to Tibetan security officials that he was first recruited by Li Yuquan, a senior Chinese official posted in Tibet. Li was earlier Head of Public Security Bureau of Nagchu Prefecture, later he was transferred to Chamdo Prefecture. Intelligence gathering by Chinese 'tourists' is certainly an issue to be considered. 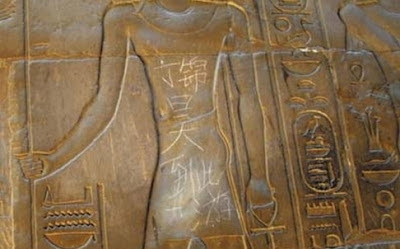 A mainland tourist who defaced a sculpture at a 3,500-year-old Egyptian temple has been identified as a teenager from Nanjing, his embarrassed parents confirmed yesterday. 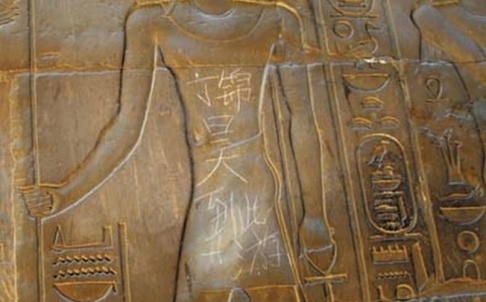 He had written "Ding Jinhao was here" on the artwork some years ago during a visit to the Temple of Luxor, the parents said in an apologetic interview with Nanjing's Modern Express newspaper on Saturday. Ding's graffiti caused an online stir this week when a microblogger posted a photo of the message, citing it as an example of shameful behaviour by mainland tourists abroad. The post attracted a torrent of replies, including suggestions that the perpetrator be tracked down. Some disclosed personal information about Ding, including his age and school, after searching his records online. The website of his former primary school in Nanjing was attacked yesterday. It showed the same message that Ding had left in Egypt, and visitors to the site had to click the message before they could open the homepage. Ding's parents told the Modern Express that it was their lack of education and supervision that led to his mischief. They said the attack happened when their son, now in middle school, was little. They were with a tourist group and did not notice when he scrawled on the sculpture, the mother said. "We have taken him sightseeing since he was little, and we often saw such graffiti. But we didn't realise we should have told him that this is wrong," she said. The mother also implored internet users not to hound her son. Mainlanders are today the biggest drivers of global tourism, but their sheer numbers and a perception that they can be insensitive travellers have strained their reputation. At a conference earlier this month to implement the newly passed Tourism Law, vice premier Wang Yang said some mainland tourists behaved poorly and hurt the nation's image. The law, to come into force in October, says that tourists should "cherish tourist resources and abide by social morality while sightseeing," although it mentions no offences or penalties. Mainland tourists made some 82 million international visits last year, according to the China Tourism Academy.